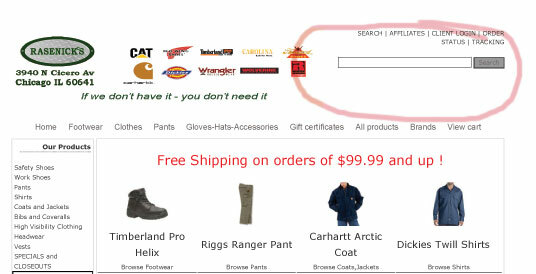 The easiest way to order on www.rasenicks.com is to use the "search" bar found at the top of every page. Here you can type in the brand that you are looking for, or a particular style name or number. 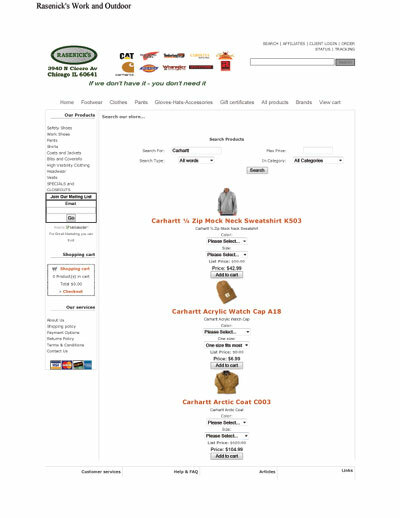 If you type in - Carhartt - your results page will take you to a listing of all the Carhartt styles we carry. You can also type in a style number (such as K503) and if we carry that item it you will see our product page for that style. You can also search for categories (such as - pants - or -bib overalls -). There will be about ten items on the first page. If there are more that 10 items in your search you can scroll to the bottom of the page and select the next page. Clicking on the image or the name of the item will direct you to a page with a description of the items and the size and color options that you have. From here you can select you options, colors and or sizes. Then select the quantity you want. A quantity of 1 is set as a default for you, you can change that here or later in your cart. Then select - Add to cart - and your selection is added to your shopping cart. You can repeat the process if there are other items that you are looking for. 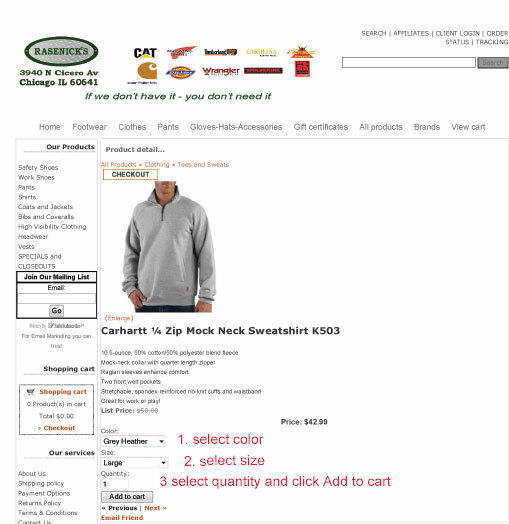 When you are ready to check out you can access your shopping cart from the middle of the left side of any page.